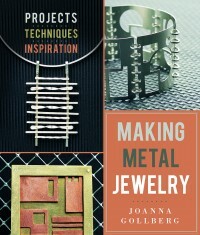 No need to solder these metal necklaces, rings, bracelets, and earrings: they're cold-connected, using such easy-to-learn skills as piercing, sawing, riveting, and joining. So even beginning jewelers can get completely professional results. Work with silver, copper, brass, aluminum, and nickel to create projects like a Circle Brooch with Thorn Clasp, Layered Cuff Bracelet, and Polka Dot Tube Earrings. Joanna Gollberg received her degree from the Fashion Institute of Technology. She is a member of the Society of North American Goldsmiths, the American Craft Council, and the respected Southern Highland Crafts Guild. Joanna has won numerous awards, including a new talent competition from the American Jewelry Design Council. Her jewelry designs and collections are displayed on her website: joannagollberg.com. She lives in Asheville, NC.